LeddarTech is proud to be this year’s winner for the best automotive technology at the 19th edition of the Electrons d’Or *, recognizing outstanding technological achievements for best electronic products, innovations and companies. The Electrons d’Or are awarded by French magazine ElectroniqueS, with winners selected by an independent panel of judges made of engineers and experts from the electronics industry. This is the first time that the Leddar technology is specifically recognized in the automotive sector, confirming its relevancy for automotive safety applications, ADAS and autonomous driving. 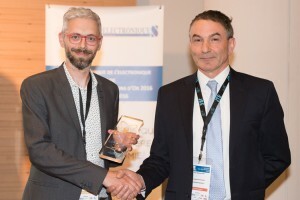 Luc Langlois, Marketing Vice-President at LeddarTech, receives Electron d’Or 2016 for best Automotive technology from Andrew Patterson, Business Dev. Director at Mentor Graphics.